Gretsch Players Edition Hollowbodies—is there really much of a difference in sound? Discussion in 'Guitars in General' started by Always-Ben, Apr 14, 2019 at 3:18 AM. I’m looking at the Gretsch Black Falcon, White Falcon, 6118, Tennessee Rose, Countey Gentleman. Based on their stats, they don’t really look like they have much difference in terms of sound—hollow body, with body material and pickups are largely the same. So what makes some of these more expensive than the other? Cosmetics? If there is a difference in sound, what is making it? Note: I’m talking about the Players Edition version of every single mentioned model. They all have the same ML bracing, locking tuners, pinned bridges. Falcons are bigger than 'standard' gretsches - 17" body versus 16". Tennessee Rose is a 6120 w/ a 25.5" neck (instead of the standard 25") Country Gent is typically thinner. 6118 is usually a 6120 w/ a two-tone paint job. Some (even within the same model) have different bracing construction and/or pinned vs. non-pinned bridges. I think there's a noticeable difference between the falcon-sized body and the 6120. I don't think the paint job (6118) or the longer scale neck (TR) changes the sound. USA $$$$, Japan $$$, Korea $$, Elsewhere $. Just depends on how much you want to pay, and how much quality you want. I like their Japanese guitars, and some of their Korean models. Soundwise, there may not be astronomical differences, but build quality and wood choices mostly. I'm kinda digging some of the Korean center block double cuts, less than a grand. I’m talking specifically about the Players Edition rendition of all these guitars, though. I think they all are Japanese made. I thought it was country gentleman and falcons that had the 25.5 scales? It seems the Players Edition has some more modern components which may raise the price. Better Bigsby, bracing, tuners, straplocks and pickups etc. Similar perhaps to what Fender does (did) with the American Standard Strats/Teles (now American Pro series). OP is talking about the Player’s editions’ ergonomics improvements vs the “vintage-correct” renditions of each model, I think. Most of the difference is in the body depth and the pinned bridge. Locking tuners are nice to have on any guitar. Do they sound worse because they’re more comfortable? Nah. I’m actually talking more about how the Player Edition series as a whole have basically made most of the guitars the same in terms of specs, very uniform. Basically what I’m asking is if I got the cheapest one, a $2199 Tennessee Rose vs the much more expensive alternatives among the Player Editoons, would there really be much of a difference in sound? Not the Players Edition model. The Players Editions, in general, come with thinner bodies, more feedback-resistant bracing, pinned bridges, string-through Bigsby trems, no load pots, and locking tuners. They have "that great Gretsch sound". My next Gretsch, assuming there is one, will be a Players Edition. This thread came at the perfect time. I just picked up a Player's Edition Black Falcon and had a little time yesterday to A/B/C/D it with my 2005 Fuji made (thinner top, floating fretboard) 6118 with TVJ Classics, my 2015 6120 SSUGR with TVJ Setzers, and (for grins) my Masterbuilt Duo Jet Firebird with a Classic/Classic Plus combo. I should've pulled out my 6120-55, but wanted to stick with filters as the comparison. I can't speak to how the Falcon compares to the rest of the Player's Edition line, though I did just sell a 6118 Player's Edition. Wish I could've thrown that one in the mix. Anyway, the Falcon was tighter and more focused than my 6118, which I guess could be attributable to the slightly longer scale length on the Falcon, or the bracing. My 6118 has sound post vs the Falcon's ML. The 6118 excelled, as you would imagine due to the soundpost, at cleaner sounds. It does great with break up, but tends to be too loose and a little undefined with a decent amount of gain. The Setzer was actually thinner in sound with less bass response compared to all 3 of the others, which was surprising to me, though the trestle bracing may be the culprit. I've never been the biggest fan of trestle bracing, and I think this test told me why. It seems to make these things less lively and more rigid like a 335, which is great if that's what you're going for. I tend to want something different from my Gretsches. With that said, the Setzer has the deepest body out of all of them, so I expected a little more from it. The Falcon sustains just as long as the Duo Jet and has just as much bass and mids response, with the softer attack that you would expect from the hollowbody. I've never played a full thickness Falcon, so I can't compare the Player's Edition to those; but the Player's Edition is a killer guitar. 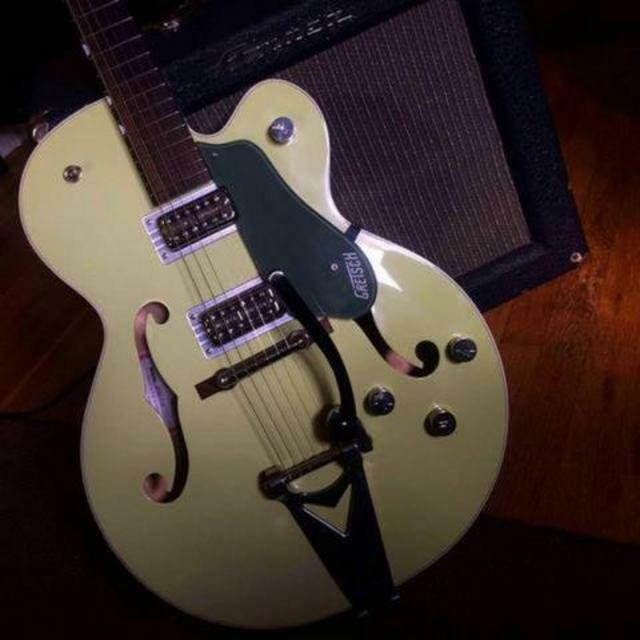 It's every bit "Gretsch" as I could want, and compares very favorably to my others. I would expect a difference between the smaller body, shorter scale length Player's Editions and the Falcon. As always, YMMV.